It’s very distressing that today the notion of communal harmony has become a myth, an overstatement. It is true as daylight that we are not living in a state of communal harmony. While this did not happen out of the blue, because of the recent attacks in Rangamati and Ramu, this is being newly comprehended by many of us. Communal discord is not a new occurrence. But when this ‘discord’ becomes visible to us in the form of communal attacks, then some other things have been added to this. Its rise in a new form also indicates that there are other things behind this. That is why in the attacks on the Buddhist temples in Ramu, I want to identify two clear layers. One is collective hatred, which in this case takes force in the name of religious belief, and in many other cases is enforced, practiced and reproduced in front of society in the form of ethnic, racial or gender hatred. This racial, ethnic or gender hatred is just another form of the ‘othering’ process, exhibited in religious garb. This hatred or othering is not often strongly visible. But another important layer to this is: the visibility of this hatred when it serves the purpose of a ‘collective’. This, we are able to see in the recent events. The poison of communalism has become very active in order to go from this invisible state to a state of visibility. Behind this there is a more active, more invisible and a more powerful group, that is the ‘politico-economic interest’, which is far more important than the communal discord. In the last few years the number of minority communities in our country has become even more minor. A few days ago when the news of this reduction in numbers was innocently and indifferently presented in the news, the scenario of relentless repression and marginalization became very vivid to me. There may be various causes for this reduction of numbers, but this survey makes it obvious that this country is becoming unlivable for minority communities. This marginalization is not just on religious grounds, this is for all minority groups. This country, this world, is becoming unlivable for all marginalized communities. But the heat of this discord from which we have become charcoal is not individual, it is institutional. We have seen the fire. After having seen the fire we can now comprehend our communal character. We can now feel revolted and spit at our own images. But is this revulsion toward ourselves sufficient now? Rather, it is now more important to probe into the historic process of how we have managed to become ‘communal’ – in name and in nature – institutionally and in wider social-cultural context . If we don’t find the answer to this question, then after such a terrifying incident we will simply be discharging our seasonal duties by aimlessly shooting our protests and then getting back to our assembly line of dead bodies. After a few days, there will be another reason, another excuse for yet another incident. These incidents will go on taking place, and slowly we will get over the revulsion towards our image and the history of the formation of this image will remain a mystery. We have been communal for many years. But how did we become like this? Are we communal by birth? Is this hatred for ‘others’ organic? Is the supremacist psyche individual? By giving nature as an excuse, by ‘othering’ those who are different, and presenting them as inferior. Anthropology at one stage tried to establish the superiority of the white people, by endearing the interest of the Western colonials, by belittling all other ethnicities outside the White and the Western as ‘native’, which have been presented negatively. By imposing a comparison of the body, color, religion, gender, ethnicity and other various characteristics, a hate for the different has been developed in our subconscious. But why was this hate constructed? What was the need for it? History shows us that creating a division and inequality among the subject population is part of the blue-print which protracted its governance structure. Even before European colonization rulers have carried out attacks over marginalized religious groups, it dominated through ‘othering’ and giving legitimacy to violence through ideological differences is a legacy of modern governance practices. The British, the European colonials prior to the British and repressive states have always created hegemonies in order to give legitimacy to inequality. That is why at every stage of socialization, there is co-existence of such things as human rights, secularism, multicultural rights and slogans of equal rights, and as on the other hand there is the inferior presentation of minorities, indigenous people, women and marginalized communities. Each of the institutions of a modern state keeps this discrimination-hate alive at the ideological level, in order to sustain a hierarchical society. To analyze these as a social scientist or a concerned citizen and to create a collective, cultural resistance to fight against this is also a constant responsibility of ours. We do it too. And so we find countless examples of communal harmony. But our powers of resistance against institutional hatred are very weak. That is why in dominant structures, after having managed our bread and butter we can only say a few words with our weak voices before getting blown away. We learn to cope, as we are consumed by the heat of ethnic-religious-gender hatred. We start to coalesce like coal so that we can be used for making fire when it is necessary. This is why we are indifferent to the rapid reduction of numbers of the minority communities. We take away our eyes from the pages of the newspaper and get down to our own fight for survival. The minorities become even more minor, Hindus become even more Hindu, Muslims more Muslim, Buddhists more Buddhist, Adibashis more Adibashi, Bengalis more Bengali, women more women, men more men – we prepare ourselves to be ignited for someone’s fire whenever necessary. The construction of the gunpowder of hatred is a global system to divide and maintain a hierarchical society. In the world history we have seen the annihilation of Jews at one time, and we are now seeing in a different but even stronger form, the Western construct of Islamophobia. Even though this hatred has been constructed in the name of religion, we know that its foundation is not in religion, but in the political economy. In this politico-economic map, ours is one of the weaker countries. Through the film ‘Muhammad’, Muslims around the world have materialized in their projected ‘fundamentalist/terrorist’ manifestation, they carried out protests in front of the American embassies. 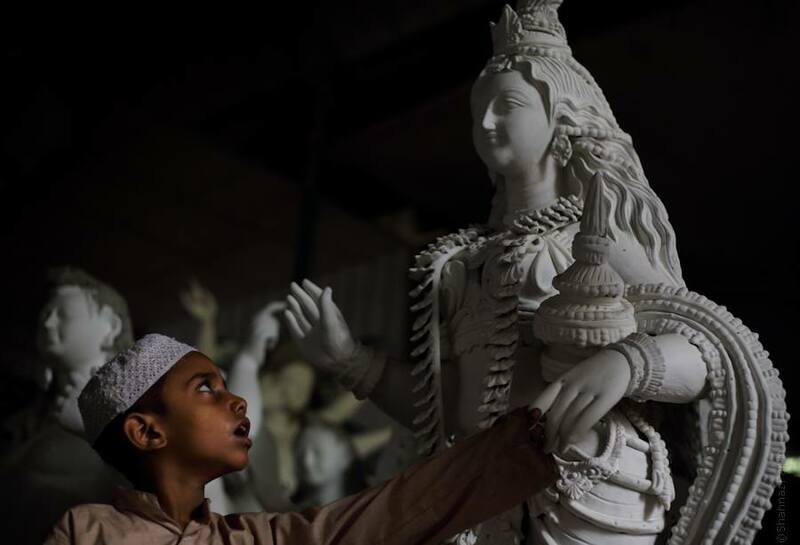 Although Bangladeshis did not dare to do so, but they have shown their anticipated communal appearance by carrying out attacks against the minority communities. The massacres in Syria are now routine presentations in the world media, but they are not worried about the killings and persecution in Myanmar, on top of that the head of their government received a peace award from the United States. Just when Bangladesh is trying to make ends meet with the victory with Myanmar over the coastal borders issue and their diplomatic relationship over the Rohingya issue, just then the ethnic, communal conflict became glaring in the Buddhist temples in the hills. Then the blame for this is also thrown at the Rohingyas. People thus burn in the fire of this hatred which is ignited by the opposing party and spread in a very calculated way. The politico-economy of this fire is not just simply communalism, it is, in fact indicative of a much larger global politics. There is no other option but to locate ourselves in this political map of the hilly areas, in this game of chess. The fire in the Buddhist temples or the killing and persecution of the hill people shows not only the ultimate expression of communalism but goes beyond that. It shows a lot more than just our ugly inhuman face. It shows the institutional process through which we are preparing ourselves to burn in order to come of use to the powerful and when necessary we are ready to burn ourselves. That is why if we only give the explanation of the visible religion-based fire of this discord then we will only be looking at the surface of this, the games that are being played underneath will remain hidden from our range of vision. We carry the poison of communalism and hatred subconsciously in our society. This is a constant. This is in the interest of the ruling class to maintain their power structure, at every level of socialization. But it is not organic nor individual, it is institutional. Hence, the resistance to this must also be strong. But we need to see much more into the horror of the recent violent incidents in Ramu, the Buddhist temples in Ukhia or the incident in Rangamati, it should be much more strongly protested. We need to get a grasp of which edge of the crater in the global imperialist politico-economic map we are situated, how and in what name we exist there. Who is constructed and presented in what role in the world theatre of Islamophobia. And who indeed are the directors, producers and distributors of this play. That is why the target of our protests should not only be our own communal or ethnic hatred, rather we need to compellingly target those who have the power to construct, consolidate and use this hatred. The collective form of communalism is the constructed ideological garb of this beast. If you simply raise your fingers at the outfit, that may well be replaced, the religious garb will be replaced with racial, ethnic or cultural garb, but the beast will continue to exist. The immediate combat in fact, should be with this beast. Translated by Hana Shams Ahmed. The original article in Bengali is attached below.